Ht / Wt: 6'1" / 222 lb. 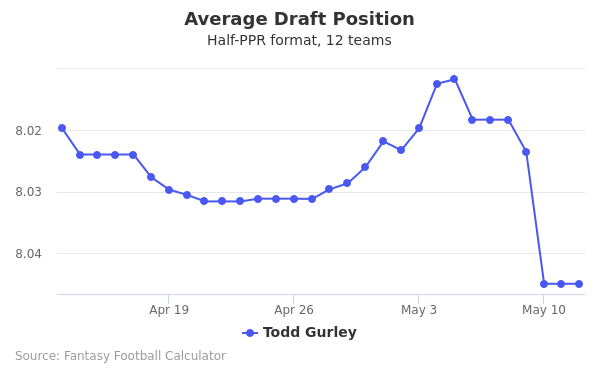 Todd Gurley's fantasy value is measured by his average draft position (ADP) in fantasy football mock drafts. 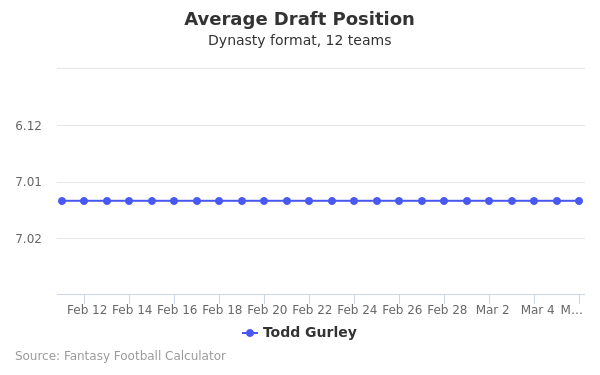 In recent drafts, Gurley's current ADP is 1.05, which indicates that his fantasy outlook is to be the 5th pick of the 1st round, and 5th selection overall. 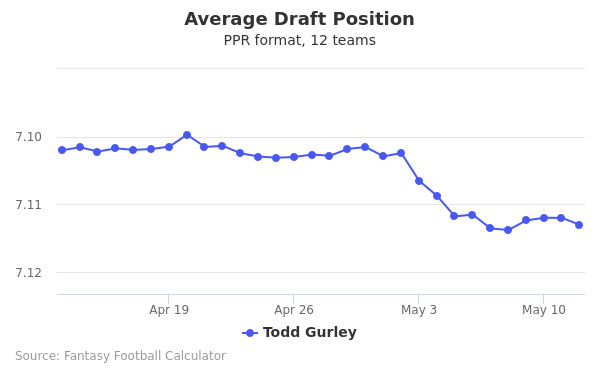 The code below will display a graph that updates every day to show the ADP data for Todd Gurley for the past 30 days in 12-team PPR leagues. Draft Melvin Gordon or Todd Gurley? Draft LeVeon Bell or Todd Gurley? Draft DeAndre Hopkins or Todd Gurley? Draft James Conner or Todd Gurley? Draft Davante Adams or Todd Gurley? Draft David Johnson or Todd Gurley? Draft Julio Jones or Todd Gurley? Draft Michael Thomas or Todd Gurley? Draft Joe Mixon or Todd Gurley? Draft Odell Beckham Jr or Todd Gurley? Draft Todd Gurley or Tyreek Hill? Draft Dalvin Cook or Todd Gurley? Draft Todd Gurley or Travis Kelce? Draft JuJu Smith-Schuster or Todd Gurley? Draft Antonio Brown or Todd Gurley? Draft Nick Chubb or Todd Gurley? Draft Pat Mahomes or Todd Gurley? Draft Mike Evans or Todd Gurley? Draft Marlon Mack or Todd Gurley? Draft Todd Gurley or Zach Ertz? Draft Damien Williams or Todd Gurley? Draft T.Y. Hilton or Todd Gurley? Draft Leonard Fournette or Todd Gurley? Draft Adam Thielen or Todd Gurley? Draft Sony Michel or Todd Gurley? Start Antonio Brown or Todd Gurley? Start Pat Mahomes or Todd Gurley? Start Mike Evans or Todd Gurley? Start Marlon Mack or Todd Gurley? Start Todd Gurley or Zach Ertz? Start Damien Williams or Todd Gurley? Start T.Y. Hilton or Todd Gurley? Start Leonard Fournette or Todd Gurley? Start Adam Thielen or Todd Gurley? Start Sony Michel or Todd Gurley? Todd Gurley was born on August 3rd 1994 in Baltimore Maryland. Gurley would go on to attend Tarboro High School where he would play three sports thus being dubbed a triple thread player. While at Tarboro High School, Gurley would play defensive back and running back. His success allowed him to complete 1,472 rushing yards his junior season and score 26 touchdowns. During his senior year, Todd Gurley became named the North Carolina Associated Press's player of the year. His success in high school made it easy for scouts to want to pick him up for college play in which he would poise himself for a successful future football career. According to Rivals.com while he was in high school Gurley was the 5th best running back thus allowing him to easily be picked up by a college. Todd Gurley opted to spend his college years playing at the University of Georgia. At the University, Gurley initially backed up a fellow redshirt athlete Ken Malcome Gurley would rush for 1,385 yards his freshman year of college in 12 out of 13 games. His success on the field would be carried all the way through his senior year of college. Todd Gurley completed a 40 time in 4.24. Gurley was able to complete his vertical with a 37.5 inch jump. His performance in college lead towards an easy decision for the St. Louis Rams as their tenth pick. Having finished his previous year of college with a torn ACL, Gurley had to sit out the majority of practices and the first several games of the full season. The rams decided even with his injury, Todd Gurley was a welcomed addition to their team and quickly added him to play during the regular season. Todd Gurley's salary contract with the rams was signed for a four year, $13,823,183 deal. Gurley would earn 566 rushing yards in his four first starts of the season thus making him one of the most successful rushers in NFL history. His week 8 victory over the 49ers landed Gurley a spot in the Pro-Football Hall of Fame. Gurleys time with the Rams during the 2015 season marked himself as a phenomenal player with extreme skills. Gurley became only the second rookie to have rushed for over 1,000 yards making him one of the best starting players ever to play as a rookie for the St. Louis Rams. His time with the rams helped to cultivate a fresh face for the team. Todd Gurley's highlights combine is immense talent and strength for an amazing display of fortitude. You can view them here. 2016 didn't fare as well for Gurley with only 885 yards completed. 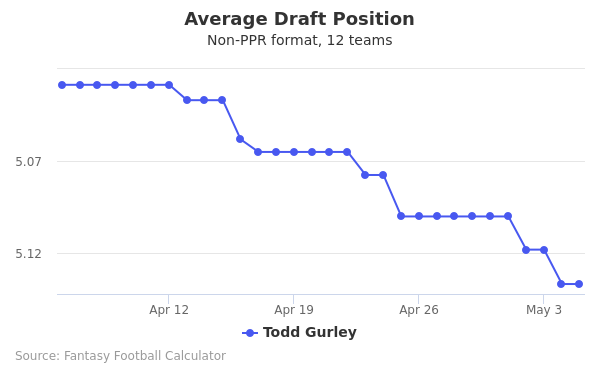 This was Todd Gurley's least successful season to date. While Gurley would start in all 16 of the Ram's games, he only scored 6 touchdowns compared to the 10 he had scored in 2015. Some attribute this change in success to the relocation of the Rams from St. Lois to Los Angeles. The change of climate has been accused of being a contributing factor in the decline of many of the players' abilities as they begin to acclimate to the hot weather that is vastly different than that of St. Lois. Todd Gurley is named after his inspiring father who goes by Todd Gerome Gurley Todd isn't an only child. However, as he has four siblings. One of Todd's greatest achievements in football came during his freshman year when he would rush over 1,000 yards at the University of Georgia. This was an achievement that had only been done previously in 1980 by the immensely famous Herschel Walker. Gurley's athleticism in football is mirrored by his love for stating in shape. Having been extremely successful in the track and field Gurley also makes sure the outside of football to take time focusing on his body and mind while off the field. Todd Gurley is very active on twitter. Those looking forward to reading what he has to say regularly can do so by visiting his profile @TG3III. Gurley has a great deal of memorabilia for sale that celebrates him as a player. If you'd like to show support for Gurley you can visit here and purchase his jersey and much more!